The DP-X1 is Onkyo’s first portable hi-res audio player | What Hi-Fi? Onkyo’s new player runs on the Android operating system and supports a wide range of high-resolution file formats including MQA. 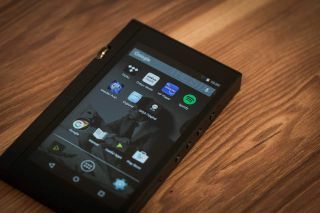 Onkyo is the latest manufacturer to join the portable hi-res audio player market with the DP-X1. The player supports a number of file formats including FLAC/WAV up to 32-bit/384kHz and DSD up to 11.2MHz. The Onkyo DP-X1 will also be one of the few players to support MQA files following a firmware update, along with the Pioneer XDP-100R. The internal audio circuit, which uses an ESS SABRE ES9018K2M DAC and SABRE 9601K amp in a dual mono setup, is mounted on a separate board from the CPU circuit. Other features include wi-fi and Bluetooth for wirelessly connecting to devices including headphones, and you’ll also find two microSD card slots onboard to allow for a hefty 432GB of storage (internal storage is 32GB), should you be prepared to shell out for a couple of 200GB SD cards. The player runs on Android, so there is full access to the Google Play store, and the OnkyoMusic app comes preinstalled. The player also has a number of outputs, including a 2.5mm 4-pole balanced headphones output, 3.5mm 3-pole headphone output and a micro USB port for charging and data transfer. The DP-X1 will be available in June, priced £700.